This dish delivers an exciting protein format where a tender steak is marvelously enhanced by the sauces and egg yolk. Mix the ingredients for the marinade and pour into a wide, shallow tray (this stops the yolks from touching each other and opening). Gently place the yolks in the marinade. Cover and marinate in the refrigerator for 12-14 hours. Chill beef in freezer 15 minutes, cut into 1/4" pieces. Combine with Tabasco, ketchup, Worcestershire sauce and salt and pepper. Half the shallots lengthwise, brush with oil and place cut side down in a skillet. Bake until scorched. Slice the radish and cut the asparagus diagonally into little pieces. 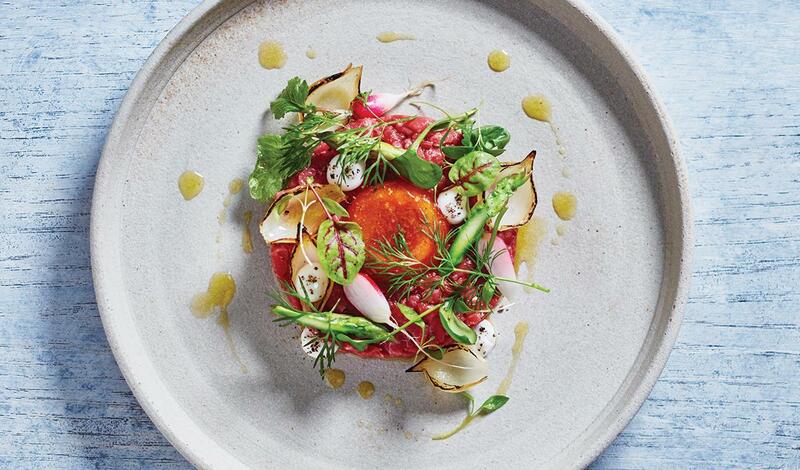 Use a round cutter to form the steak tartares. Place an egg yolk in the middle. Garnish with chopped cornichons, capers, shallots and brûléed shallots, salad leaves and dill tops. Finish with dots of mayonnaise.